Much like the other 30th Anniversary GI Joe Figures, this Hiss Driver is a more realistic, modern update of the classic design. It’s still recognizable as the old character, but leans a bit away from the fantasy. The most updated part is his chest plate. A simple blue painted area on the vintage figure, this version has a what appears to be an armor plate protecting his vital organs. This make a sense for an armored vehicle driver. The Cobra logo stands out on this chest piece. The whole thing is attached into his web gear. The second update I noticed was his colors. They are still blue, red and black, but they’ve been muted. Still a little bright for the battle field, but a far sight better than the vintage bright red. One of the things I love the most about this figure is they didn’t go crazy updating the head. It is pretty much a straight up modern version of the vintage figure. The forehead might have an arrow instead of a cobra head as part of his “mohawk”, but that isn’t anything too noticeable. I do kind of wonder if his goggles are too low on his face. They don’t look bad, but when you at the size of his forehead, it looks like his eye protection might be down on his cheekbones. The part of this figure I’m not sure about is his legs. Yes, I understand they are suppose to look like armor. But why? The vintage figure has more of a padded look on the legs. This one has some strange armored pieces all over them. 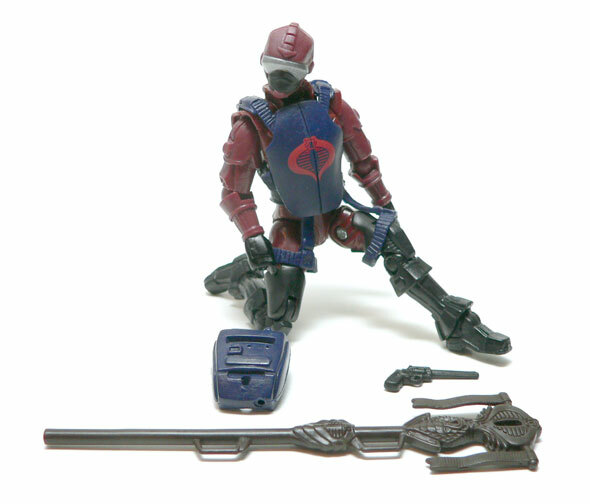 They remind me more of the Micronaut Pharoid than any GI Joe figure. For a vehicle driver, there’s a lot of gear here. More than some figures get even. 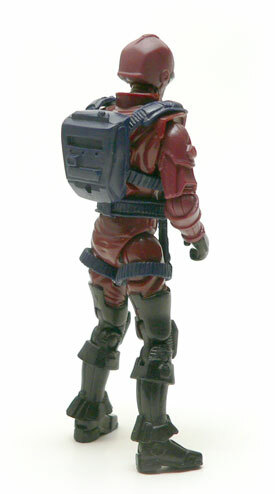 First up is a backpack that is matched to his web gear. It’s nice little addition for when he is out of his tank. He also come with a large Cobra herald. Why? I have no idea. There’s a spot it will fit on the tank, so I’m hot sure if this is for when he’s carrying Cobra Commander into battle or not. 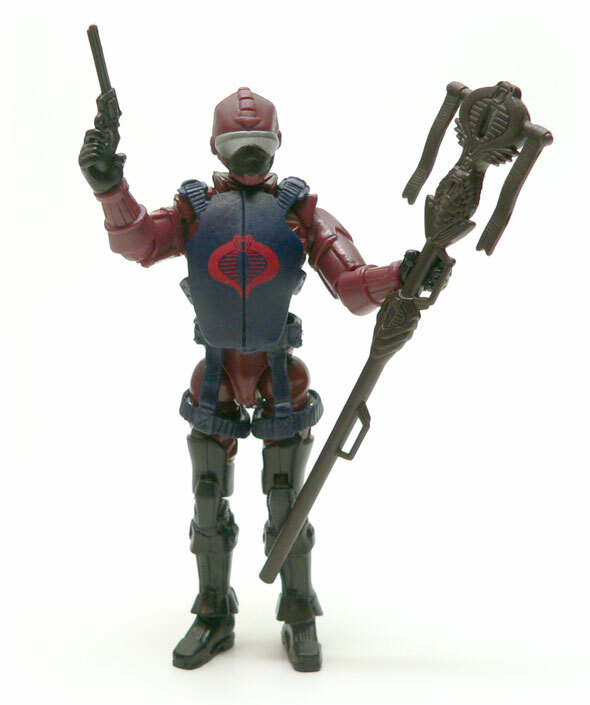 Cobra always has a ceremonial side, so it’s not totally without precedent. Last up is a big ole revolver. This is a bit of hand cannon. It seems odd to see a revolver in the hand of of a driver of a fancy tech tank. I’d imagine if it came down to having to using that thing would have some stopping power. In general, I’m pretty pleased with this update to the HISS Driver. He’s kept the overall look of the vintage figure but gave him a more detailed appearance. Add to that the fact that Hasbro has him accessorized fairly well, and he’s really good considering going forward drivers will be more accessories than fully realized figures. That really is a nice update of the original HISS Driver. Anyone who read the final encounter between Kwinn and Dr. Venom in issue #19 of the Marvel series knows how important that chest armor can be. HISS Drivers were relatively easy pickings even for an angry Eskimo, and on foot to boot!